I just love artichokes. They are a thistle, and grow quite easily here in the Western Cape. You can let them flower until beautiful and purple, or you can pick them when they are ripe and ready to eat. Many people do not know how to prepare them, and really, the are simple and easy. We only get the mature vegetable here, but I have to admit to preferring the soft young ones we get in France and Italy as they are nicer to cook with and easier to incorporate into a meal. You can serve the leaves with an hollandaise sauce, a plain mayonnaise or even lemon butter sauce. Be patient and enjoy the leaves, as it is the heart you really want! That is the best part of a mature artichoke but do take care to get all the thistles out before eating it. Artichokes are so good. They’re everywhere at the moment. Stuffed artichoke hearts are very good. I love that about France in the summer! Love them! Eat them often! I would eat them more often if Dave did! 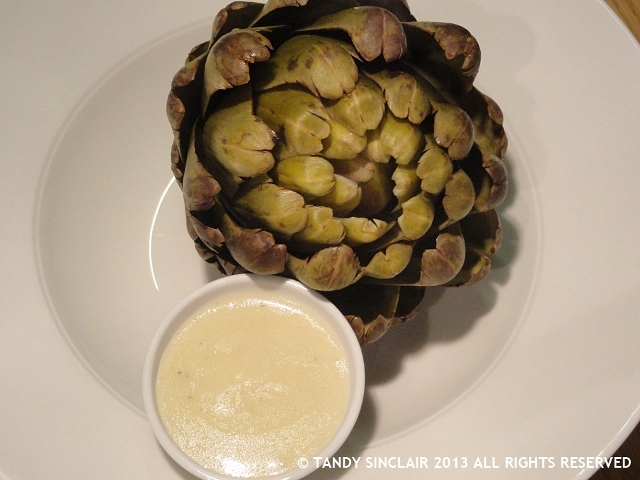 I absolutely love artichokes: here in Australia their season coincides with that of young fresh asparagus in spring. Some people here go for the heart immediately which to me is such a waste: it’s so much fun sitting around the dining table, dunking the leaves in your favorite sauce and slowly sucking them 🙂 ! I have to admit that I do cut about the top 1/3 – 1/4 off tho’ horizontally ere I put them in the acidulated water 😀 ! They are so simple to prepare and if you can get them from the market, quite cheap as well! Love em! Here in Andaucia they grow in abundance and when I first arrived and cooked them like this (I still do as I love them like this) everyone thought I was mad. They’re so cheap and plentiful here that they only eat the hearts 🙂 They dn’t know what they’re missing! Wow, I’d never seen one flowering before, they are beautiful. I like them too, but have only cooked them myself once, when a friend gave me some from his garden. Love the picture of the flowering artichoke. I have never seen one in flower. 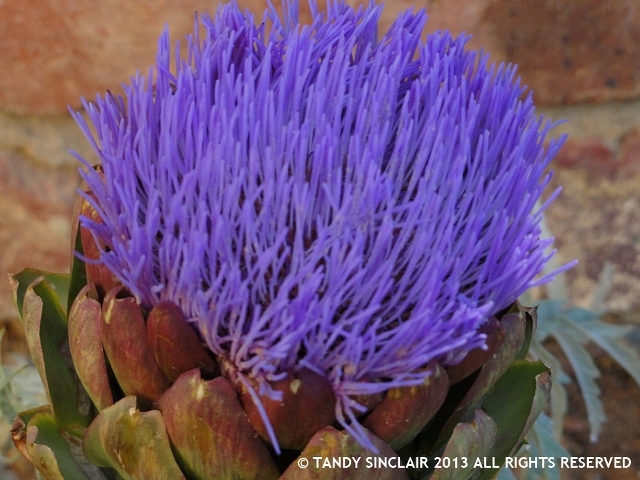 I love artichokes…both to eat and also to let a few bloom as they are so pretty. I usually leave mine to bloom as the colour is so amazing! I do love artichokes although I haven’t had one since I left the UK. I must keep my eye open for them now I’m down in the Cape.